The Best EDM blogs from thousands of music related blogs in our index using search and social metrics. Data will be refreshed once a week. Also check out EDM Podcasts and EDM Videos from Top 100 EDM Youtube Channels. 2.24 plug.dj | Latest info on everything plug.dj! EDM newsletter is a comprehensive summary of the day's most important blog posts and news articles from the best EDM websites on the web, and delivered to your email inbox each morning. To subscribe, simply provide us with your email address. About Blog Sharing the latest and greatest in the Electronic Dance Music (#EDM) scene. Facebook fans 2,887,747. Twitter followers 104,827. Denver, CO About Blog The world's foremost authority on EDM : free music downloads, artist interviews, industry news, curated playlists, trending charts, and more. Facebook fans 1,721,143. Twitter followers 168,744. New York, NY About Blog Hailed by Billboard Magazine as “the voice of the EDM generation,” Dancing Astronaut is a website dedicated to quality dance music. Facebook fans 840,058. Twitter followers 194,492. About Blog EDM Sauce is your #1 Source for Electronic Dance Music. Get the latest on EDM News, New Music, Interviews and our EDM Lifestyle Store at #1 EDM Blog. Facebook fans 219,885. Twitter followers 49,175. Los Angeles, CA About Blog Your destination for all the latest EDM Music & Tech News. Facebook fans 754,873. Twitter followers 87,465. Chicago, IL About Blog Your source for all things trap music, hip hop, 808 bass music & everything in between. A new order for underground music and culture. Facebook fans 1,160,038. Twitter followers 43,065. Worldwide About Blog Get the latest dance news and videos from Mixmag. Facebook fans 1,036,976. Twitter followers 295,432. Miami, FL About Blog An EDM music blog sharing the best Electronic Music and information on EDM Festivals, EDM Events, EDM News, EDM Concerts and Electronic Music Culture. Facebook fans 94,814. Twitter followers 3,039. Tampa, FL About Blog Noiseporn is your ultimate guide to everything dance music, bringing you the latest EDM news, artist interviews, EDM reviews and more. Facebook fans 26,024. Twitter followers 3,993. San Francisco, CA About Blog This subreddit is for discussing the production of electronic music. Facebook fans 1,131,217. Twitter followers 496,834. Facebook fans 240,881. Twitter followers 39,480. San Francisco, CA About Blog A place for sharing, finding, and discussing music in the Dubstep genre. Facebook fans 1,132,035. Twitter followers 497,247. About Blog Mixing.DJ is an Electronic Music Magazine - Source of the best promo Live Sets & DJ Mixes. Facebook fans 252,203. Twitter followers 7,037. London About Blog One of the world's leading electronic music brands, the home of bass music. Find the latest news, interviews, uploads, live events, festivals and more. Facebook fans 855,571. Twitter followers 226,258. Australia About Blog Stoney Roads is Australia's leading dance and electronic music blog. An Influential on-the-minute news site and cultural community. Facebook fans 40,801. Twitter followers 9,838. Facebook fans 135,810. Twitter followers 11,877. ÜT: 40.745021,-73.729404 About Blog EARMILK is an online music publication that straddles the line between underground and mainstream. Covering Hip-Hop, EDM, Indie, MP3s, downloads, festivals and the in-between. Facebook fans 152,583. Twitter followers 47,472. New York City | Los Angeles About Blog The Official Blog of Splice. Splice is a cloud platform for music creation, collaboration and sharing. Create fearlessly with Splice. Splice can be helpful for EDM producers who are starting their own production. Facebook fans 74,291. Twitter followers 16,188. 24. plug.dj | Latest info on everything plug.dj! Los Angeles, California About Blog We love sharing and discovering music with people from around the world. We believe that listening to music chosen by real people - just like you - creates a far more interesting musical journey. That is why we created plug.dj. We are a small team of technologists, musicians, nerds, DJs and designers, who are equally as passionate about our community as we are about music. Facebook fans 304,507. Twitter followers 45,402. San Francisco About Blog The largest community for DJ and producer techniques, tutorials, and tips for EDM producers. Facebook fans 310,654. Twitter followers 78,901. Worldwide About Blog Follow this site to get latest updates and news on music for DJs and producers. Facebook fans 480,233. Twitter followers 31,867. Auckland, New Zealand About Blog Ideas and Resources for Electronic Dance Music Production. Facebook fans 10,887. Twitter followers 2,234. Tallahassee, FL About Blog GloFX designs and manufactures products including Diffraction Glasses, Kaleidoscope Glasses, Rave Goggles, Lasers, LED Fiber Optic Space Whips, Glow Poi, Light Show Gloves, Spinning Orbits and more. Facebook fans 49,628. Twitter followers 2,206. Boston, MA About Blog Written by students for students, VergeCampus.com is an online lifestyle publication focused on pop culture, music and college lifestyle. Facebook fans 10,110. Twitter followers 1,918. NYC, LA, Online Courses About Blog Dubspot is a cutting-edge electronic music production and DJ school in New York City, Los Angeles, and Online. As a Music School for both aspiring and experienced artists alike, Dubspot's mission is to inspire and enable its students to achieve their creative goals. Facebook fans 138,952. Twitter followers 42,112. About Blog Chicago's #1 source for Electronic Dance Music, Interviews, Music Reviews, News & More. Facebook fans 136,309. Twitter followers 24,374. The Sunshine State About Blog SmashTheClub.com Blog is for the DJ who have an original, remix/bootleg, or mix and want to it to be heard around the world. And also Open-Format tracks from the best DJs & producers from all over the world. Facebook fans 7,352. Twitter followers 4,834. About Blog An electronic music blog which give information about various tracks and mix tapes at the same time which can be downloaded! Facebook fans 4,895. Twitter followers n/a. Dublin, Ireland About Blog Nialler9 is the most-read Irish music blog with around 55,000 unique visitors per month and has been running since November 2005 which also includes electronic dance music. Facebook fans 39,176. Twitter followers 41,892. San Francisco About Blog The world's top media source for electronic dance music & hip-hop; artist interviews, industry news and new releases. Facebook fans 80,773. Twitter followers 22,880. About Blog The definitive entertainment platform for electronic dance music. Facebook fans 41,199. Twitter followers 2,459. Colorado, USA About Blog Mix 247 EDM is your favorite Electronic Dance Music station. Your source for the latest EDM news, EDM events, EDM Fashion, EDM music, exclusive artist features, and daily Dj Shows. Facebook fans 1,442. Twitter followers 22,191. About Blog The Music Ninja - A new music blog about discovering great songs from all genres: trance experimental hip/hip remixes indie rock, electronic music free mp3s every day reviews. Facebook fans 31,783. Twitter followers 25,320. About Blog RaverRafting.com is a leading source for electronic dance music news, artist profiles, music reviews and event information. Founded in 2011, RaverRafting.com has seen over three million unique visitors and its community has thousands of members on Facebook, Twitter and other social media sites. Facebook fans 25,678. Twitter followers 14,309. NYC About Blog Serving up the hottest dance, hip hop, and club mixes and DJ remixes. Facebook fans 13,199. Twitter followers 3,722. Los Angeles, California About Blog EDM Maniac produces online content for dance music fans that inspires and connects everyone in the dance music community. Facebook fans 155,162. Twitter followers 7,361. About Blog Ultimate nightlife destination in Kuala Lumpur, Malaysia. Search for clubbing tips and clubbers guide, latest events, DJ, nightclubs, parties, EDM music review & news. San Francisco, CA About Blog Your Source for Electronic Dance Music events on the West Coast. Facebook fans n/a. Twitter followers 1,354. Cape Town About Blog IDM Mag is all about electronic dance music. The brainchild of Dave Mac, ex-editor/owner of the now defunct BPM Magazine, IDM Mag is a media channel for electronic music lovers and electronic music makers. Whether you're a DJ, a producer, sound engineer, promoter or simply a lover of all things electronic in music, IDM Mag updates daily with cool features, news, opinions and tech stuff. Facebook fans 42,018. Twitter followers 9,317. France About Blog Sidekick Music is an independent and creative brand launched in 2016 by Kaa Production. We are a full on, Electronic Music Blog & Record Label. Facebook fans 7,981. Twitter followers 149. About Blog This is a leading EDM Community which covers House, techno, trance, EDM and more. Facebook fans 48,524. Twitter followers 11,802. About Blog Cahul House Mafia promotes EDM tracks everyday. Bangkok, Thailand About Blog Founded in 2018 for the purpose of sharing and promoting electronic dance music in southeast asia for both artists and fans. sora music asia is a curated music blog, playlist, radio livestream & record label. Facebook fans 17,440. Twitter followers n/a. Philadelphia, PA About Blog By The Wavs has everything from house to hardstyle and dubstep. We have it all and will be reporting on everything and anything EDM. We post mixes, live sets, new songs, concerts, festivals, news and albums. Facebook fans 2,823. Twitter followers 9,587. Los Angeles, CA About Blog Electronica music, ambient music, experimental music, techno music, dub-techno music news, reviews, interviews and features from a strangely isolated place. Facebook fans 12,397. Twitter followers 3,433. NYC About Blog NYCRavers is an event production company based in New York City. Originally an online community focused on providing information on the non mainstream electronic dance music events in and around the tri state area it has evolved to be one of the most respected event production companies in NYC. Facebook fans 9,692. Twitter followers 699. About Blog EDM ghost production is the useful service for artists who need qualitative and unique music and who appreciate prompt and understanding producers. Also EDM ghost production is the dynamically developing company that is actively searching for new talented employees-producers. Facebook fans 347. Twitter followers 4. About Blog We are your reliable source of EDM News about your favorite DJ's, festivals, producers and software & hardware updates. Facebook fans 146,002. Twitter followers 38,742. Worldwide About Blog 2017's TOP EDM blog. Featuring daily top EDM videos, reviews, free tickets, sets, events, and news for all Electronic Dance Music followers! Facebook fans 40,221. Twitter followers 1,779. Toronto About Blog An electronic music blog about new, popular, and underground artists. Dubstep, electro, nu-disco, techno, deep house, moombahton etc. Facebook fans 14,230. Twitter followers 4,245. About Blog One EDM is here to create a virtual space to fill the gap between artists, their fans, and the professionals behind the scenes by providing news and updates on all happenings in electronic dance music. Facebook fans 11,965. Twitter followers 3,614. Global World, USA About Blog Keep up with latest EDM music from Global Money Group. Facebook fans 383. Twitter followers 273. Liverpool, England About Blog The Waveform Transmitter is a cutting edge electronic music website bringing you the best in underground music from new and established artists alike. Facebook fans 2,458. Twitter followers 1,578. Cyprus About Blog Are you looking to download Free Sample Packs for your Dance Music Productions? From time to time we are offering Free Samples to help amateur music producers to take their music tracks to the next level. You can find a variety of Drum Loops, Acapella and Vocal Samples, Drum Kits, Music Samples, Loops, Midi Files, Construction Kits, DAW Templates and many more. Facebook fans 6,034. Twitter followers 177. Facebook fans 413. Twitter followers 3. About Blog Trap Music (TrapMusic.biz Project) feature the best trap music and edm tracks. You can find the best trap music downloads and trap music videos here. Facebook fans 4,815. Twitter followers 13,769. SF NYC About Blog Caveman Sound is here to supply a fresh selection of music for you. Spreading good vibes and a considered aesthetic to like–minded individuals around the world – through daily posts, exclusive mixes, interviews, curated playlists and more. Discover and enjoy. Facebook fans 4,142. Twitter followers 2,818. Buffalo, NY About Blog Dance and Rave is on a mission to build a global community with an interest in or passion for electronic dance music and its culture. Whether your taste is in Deep House or Hardstyle or Trap, it wants to unite people from all around the globe in a movement of peace, love, and unity. Facebook fans 4,346. Twitter followers 841. Australia About Blog Discover free DJ music recommendations from emerging and established artists daily. New releases and hidden gems. Filter by Genre, BPM, Key & More. About Blog FutureMusic the latest news on future music technology DJ gear producing dance music edm and everything electronic. Facebook fans 117,033. Twitter followers 103,279. Worldwide About Blog Electronic Dance Music News website about EDM - house music, progressive, electro, techno, trance, releases, promos, mixes, podcasts, videos. Facebook fans 40,142. Twitter followers 64,996. About Blog Rave Rebel is your one stop shop for rave clothing, light up shoes, festival fashion and EDM apparel. Facebook fans 19,565. Twitter followers 50,665. About Blog DailyDoseOfBass.com is an EDM blog dedicated to providing the newest music from upcoming and established artists in the game. Facebook fans 17,392. Twitter followers n/a. London, England About Blog This blog writes all about your favorite djs and latest news in the music industry. Facebook fans 13,954. Twitter followers 261. Facebook fans 2,271. Twitter followers 8,966. About Blog Fitness and Nutrition blog that provides Electronic Dance Music playlists and mixes for people to listen to while they workout. We make EDM Playlists and Mixes for you to workout to. Facebook fans 141. Twitter followers 52. About Blog 909originals is a website dedicated to delving into the past and uncovering the stories behind some of the greatest dance music (including house, techno and all other classic derivatives) tracks, people and clubs. About Blog A Blog For All EDM Followers, Beginners, Party Seekers & Ravers To Keep Themselves Updated With All The Latest Music, Gigs, Festivals In India And Abroad. England About Blog A place to talk, listen to, and download electronic music. Ilictronix has been a mainstay of the electronic music blog scene and continues to offer updates and insights on all things electronic music both past and present. Facebook fans 922. Twitter followers 190. About Blog An EDM blog and promotion network focusing on up and coming producers. Rave City! About Blog Your #1 source for new electronic jams. ElectroJams is an independently run electronic music blog, whose goal is to aggregate the internet and provide our users with the best music on a daily basis. These days, it’s hard for music fans to stay up to date with their favorite artists and labels, so we aim to make that job a little easier for them. Facebook fans 11,552. Twitter followers 2,049. About Blog Your source for biggest bangers in the EDM industry. From original tracks, remixes, live sets, albums, to festivals, shows, interviews, news and more. Facebook fans 1,575. Twitter followers 831. About Blog Dj Frequencies is a techno and electronic music journal developed and maintained by BlakeAndrew, an underground techno advocate, activist, event enthusiast, and from time to time a dj/producer. Miami, FL About Blog Get up to date EDM news & blogs. Get the latest scoop on whats going on with in the world of EDM. Facebook fans 189,528. Twitter followers 9,101. About Blog 657 Deejays is a magazine covering all aspects of the EDM scene. We strive to keep our readers informed with all the latest news from the world of EDM, including interviews, reviews, event reports, new releases, op-ed, humor and more. About Blog Digital Electronic Dance Music Magazine for the EDM community with music producers, DJs, industry leaders, gear, apps, rave fashion and music festivals. Facebook fans 3,945. Twitter followers 15,113. About Blog All Access Electronic, gives you a non-biased insight into Electronic Music world of news, gossip, updates, events, festivals and much more! Facebook fans 1,391. Twitter followers n/a. About Blog This blog is simply dedicated to Electronic Dance Music. We cover new & old songs , rave events, and etc. About Blog Blackdown Blog is about dubstep..grime..uk funky..comment..culture authored by Keysound label co-owner, Rinse FM DJ, producer, London-based ex-blogger & journalist. Facebook fans 7,789. Twitter followers 8,112. About Blog An Electronic Music Blog with mixtapes, and videos of various types of music right from house, techno and many more. Global About Blog Only The Beat is your #1 source for Electronic Dance Music. Covering EDM news, all genres, interviews, free downloads, mixes, video content and more. It is an international online community that makes it easy to discover new tracks, stay up to date on the latest news and events, grab an occasional free download, and get to know your favorite artists. Facebook fans 22,266. Twitter followers 6,357. Seattle About Blog EDM-TV.com is the number one place to find, discover and watch videos of your favorite EDM artists. Browse through our selection of well known EDM brands such as Ultra Music, Spinnin’ Records, Mau5trap, Kontor, Armada Music, Dirty Dutch, Black Hole Recordings and many more. About Blog Sponsored by Makino, EDM Matters is an open forum for die/mold shops and manufacturers in the EDM community. The purpose of this forum is to help participants share insights and stay current on the latest technologies and processes in the field of wire and Ram EDM. Amsterdam About Blog Home is where the TECHNO is. My Cup of Tech is an underground electronic music blog focused on house and techno music, news and much more. Facebook fans 1,120. Twitter followers 619. About Blog Follow EDM Authority to get industry updates, artist interviews, music releases, EDM news, reviews, curated playlists and more. About Blog A blog about uplifting, emotional electronic dance music. About - An electronic music blog from the North of England. Independent music news, reviews, features, interviews and videos. About - Latest Electronic Music News. About - Latest Electronic Dance Music Events News and Updates. 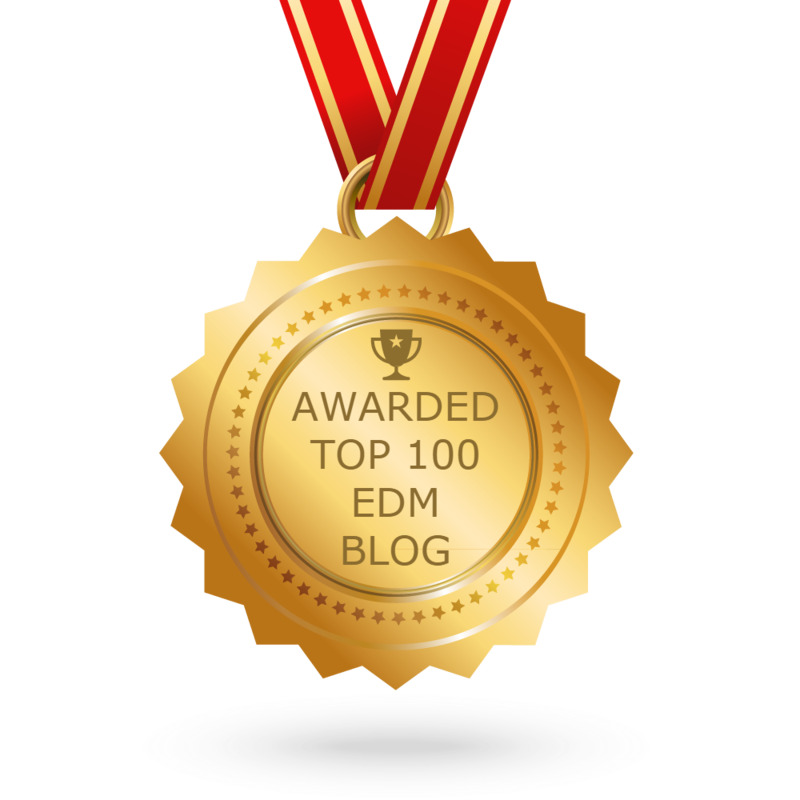 CONGRATULATIONS to every blogger that has made this Top EDM Blogs list! This is the most comprehensive list of best EDM blogs on the internet and I’m honoured to have you as part of this! I personally give you a high-five and want to thank you for your contribution to this world.